Martin Guptill has won this year’s Walter Lawrence Trophy with a thumping 35-ball hundred scored for Worcestershire against Northants in the Vitality Blast match at Northampton on July 27. The New Zealand opener’s fiery innings is the fastest century from balls faced in the history of the competition, which began including limited-overs innings in 2008. 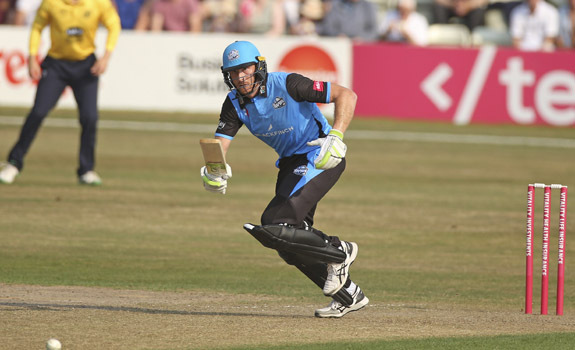 His hundred is the second fastest in domestic T20 games, 1 short of Andrew Symonds’ 34-baller in 2004, and the joint-fourth fastest T20 century of all time. The 32-year-old Aucklander has played in 47 Tests to date, and in January this year became the second New Zealand batsman, and the ninth overall, to score a century against each of the nine full-member Test-playing countries. He has played in 159 One-Day Internationals, during which he made 13 hundreds, including an unbeaten 237 against West Indies in the quarter-final of the 2015 World Cup, as well as 75 T20 Internationals. Following in the footsteps of Ken Rutherford (1994), Chris Cairns (1995) and Scott Styris (2012), Guptill is the fourth New Zealander to win the Trophy, which will be presented, along with a cheque for £3,000 and a special medallion, at the Walter Lawrence Trophy Dinner in The Long Room at Lord’s on November 6. The 18-year-old Chelmsford-born batsman and wicket-keeper played in 10 matches for Essex 2nd XI this season, recording his first century, 125, for them against Gloucestershire 2nd XI at Bristol in July. Will is currently playing in Sydney for Mosman in grade cricket where he hopes to continue to develop his game. Will is the eighth winner of the Schools Award and he will receive a special medallion and a Gray-Nicolls cricket bat at the Walter Lawrence Trophy Presentation Dinner in The Long Room at Lord’s on November 6.